Dunes & Desert offers opportunity to ride this vessel of the desert, the unique dromedary camel (yes, the one with one bump). Discover beautiful, surprising landscapes with nothing to be heard but the quiet, padded thump of the camel’s hove to the ground! We also invite you to come explore the stony and rocky desert landscapes north of Marrakech by camel. Cross the rocky desert and a beautiful palm grove to arrive in a charming house for a homestay lunch and discover the traditional way of life of Amazigh (Berber) families! 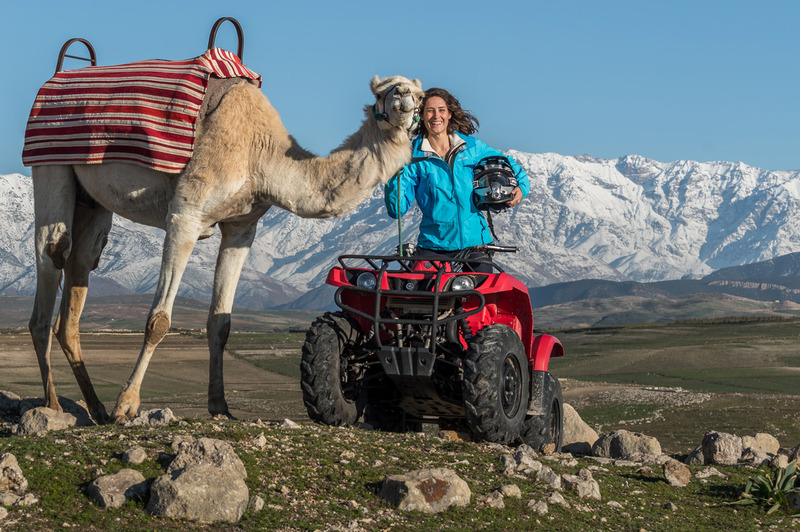 It is also nice to combine a camel ride with quad or buggy excursion. Enjoy a camel ride in the morning, traditional lunch in an Amazigh village where a family will welcome you with open arms, and in the afternoon discover the local desert and the Jbilets hills. An ideal way to practice two activities in the same day! This activity is open to all and offers an accessible window into the life of the people who earn a living in these surprising lands. It is ideal for both families and groups of friends on holidays wishing to truly experience the culture of these unique landscapes. Other walks are also available in the pocket Agafay desert on the outskirts of Marrakech, near lake Lalla Takerkoust, Ourika, Imlil, Kik, Amizmiz and the majestic landscapes of the Atlas foothills. Truth be told, the most difficult thing is to choose which adventure you will go on! Ask away, we’d be delighted to advise you! Become a real nomad of the desert by choosing one of our camel rides around Marrakech. 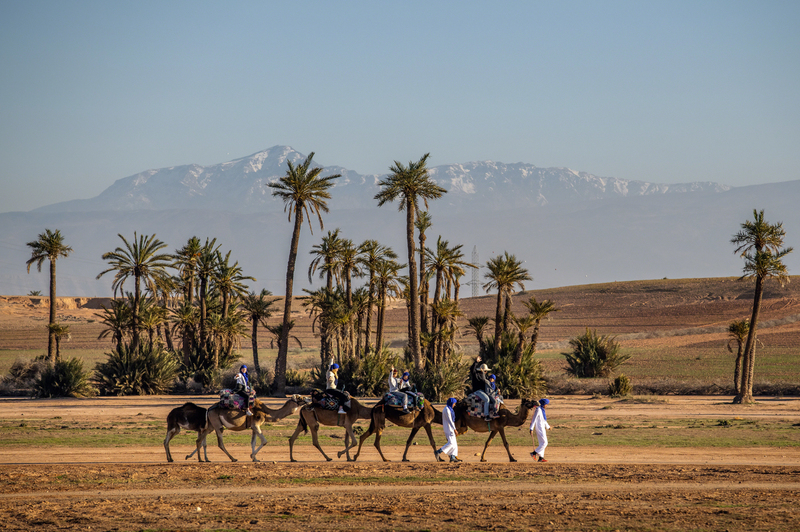 It is a « must-do » during your stay in Marrakech: camel riding in some amazing landscape (palm groves or desert). Live exceptional moments that you will remember your entire life! Why choose Dunes & Desert for a camel ride? 1 / For the authenticity: during the walk, you will stop at the locals for a tea break, where you will discover the hospitality of the inhabitants of Marrakech and taste the delicious Moroccan pancakes. Dunes & Desert provides you with a cheich (the nomadic scarf): you will be protected from the sun and will have the style of a real nomad, perfect for the pictures! 2 / To get off the beaten track: choose a camel ride with Dunes & Desert is the assurance of discovering authentic places, only in small groups or private ride, far from the crowds of tourists. 3 / For the respect of animals: our camel drivers are experienced and respect nature and animals. Our guides will answer all your questions about this iconic animal. Our camels are well treated: you can enjoy your ride peacefully! Learn more (blog article link). 4 / For the memories: we take pictures throughout the walk to immortalize your day and offer you beautiful holiday memories and what to feed your Instagram account. Some pics are freely available on our Facebook page in albums on the date of your activities: https://www.facebook.com/dunesdesert/, and others, taken by our photographers are proposed for sale at the end of each session at cheap price. 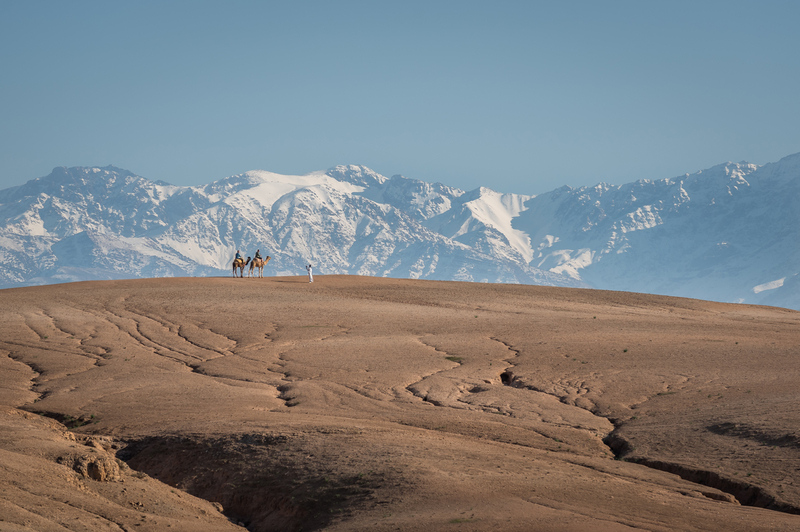 For all our camel excursions, we advise you to wear comfortable clothes, not too tight, and warm in winter. It is recommended to wear closed shoes (no flip-flops) and long pants (avoid shorts and short skirts for respect of local people). Don’t forget sunscreen in summer, or wear a long sleeve top to prevent sunburn. Camel rides are available all year round. Two departures a day are organized, except during periods of high heat where the ride takes place only in the morning. Children under 10 must be accompanied by an adult and therefore share their mount. They pay half the price. We also propose to combine a camel ride with quad or buggy. 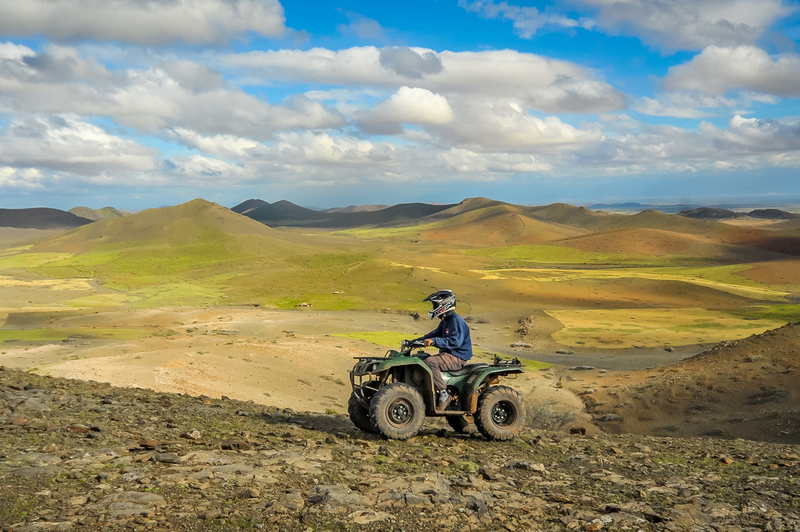 You start by a camel ride in the morning, then you enjoy a traditional lunch in a Berber village, and in the afternoon you discover the desert and hills on ATV. Ideal to practice two activities in the same day! This activity is open to all, this is the typical activity not to be missed during a stay in Morocco. It is ideal for both families and groups of friends on vacation. NEW: we now propose a PRIVATE camel ride in the Agafay desert. 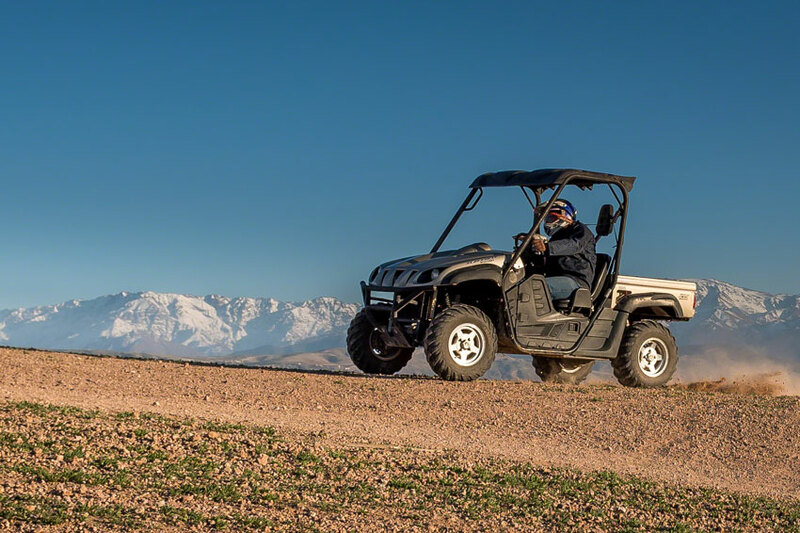 Imagine arid hills with the snowy mountains of the Atlas mountainsas a backdrop… A real postcard! between the Sahara and the Atlantic … A must-try! – The size of the camel is from 2.20m to 2.50m at the withers and its weight varies between 400 and 1100 kg depending on the breed. It is herbivorous and can live on average up to 25 years. – The camel has very long eyelashes to protect it from sandstorms in the desert. They are also able to close their nostrils for the same reasons. – The camel has a wide, elastic foot without shoe, perfectly suited to walking in the sand. – The males drool a lot during the breeding season, it is how they charm the females. 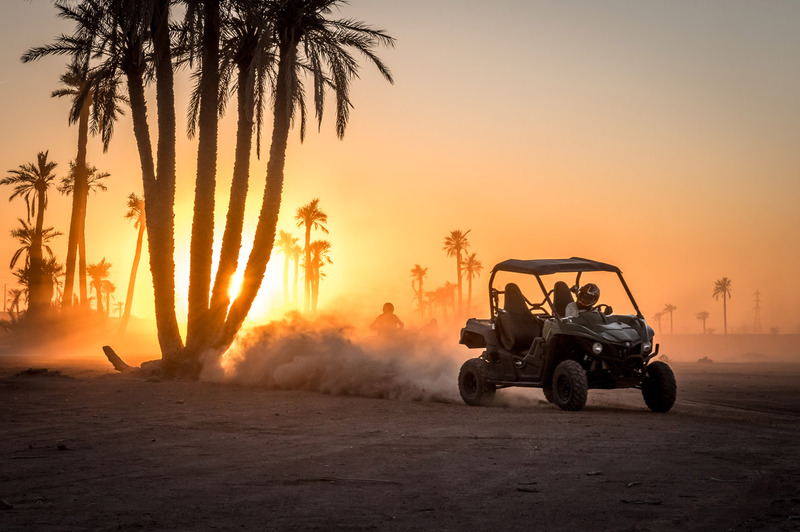 Dunes & Desert is an activities designer, specialized in camel rides, quad and buggy tours, stand-up paddling, mountain biking, trekking, hot air ballooning and many other fun activities. With 15 camels and several hundred positive reviews on Trip Advisor, our reputation is well established in Marrakech. 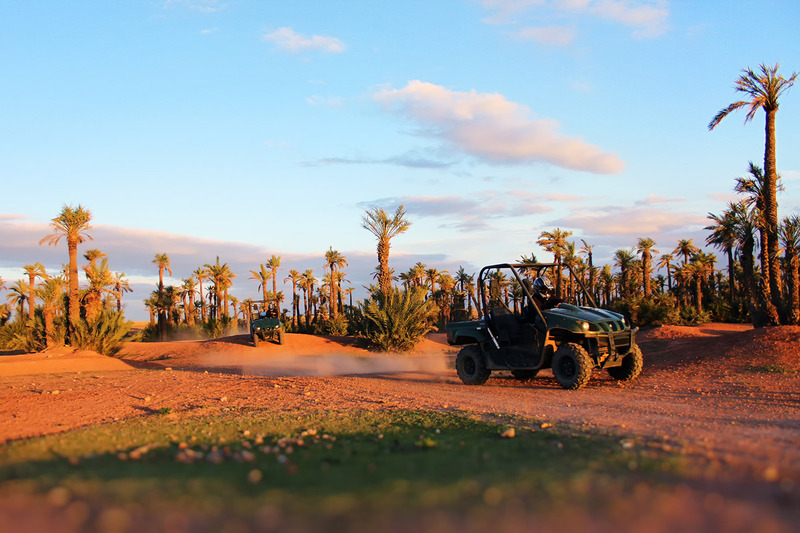 Choosing an activity with Dunes and Desert is the assurance of an unforgettable day!